Dolly Goyal, SMCL Youth Services Manager and CLA President, cutting the ribbon to the CLA Exhibit Hall. CLA is the community for California libraries. The Association provides leadership for the development, promotion and improvement of library services, librarianship and the library community. We help members excel in a fast-changing job market. We're a resource for learning about new ideas and technology, and we actively work to influence legislation affecting libraries and librarians. CLA hosts a conference every year in a different part of California to bring library staff state-wide together to ignite ideas and spark meaningful conversations. This year CLA (as the conference is normally called) was held at the Santa Clara Convention Centeropens a new window. With CLA being so close to home I had no reason to skip it like in years past. Olivia inserting an idea in the Idea Box. This year it was a two-day conference, with Friday being a pre-conference day where you could come in early to check out exhibitors and library vendors. I took my daughter to the Friday exhibit hall grand opening and saw Dolly Goyal do the ribbon cutting. Dolly Goyal is this year's CLA president as well as our San Mateo County Libraries Youth & Families Library Services Manager. Go Dolly, our fearless Youth Services Leader! After the ribbon cutting, I went straight into the exhibit hall with my daughter. It was a giant playground for Olivia, who has labeled herself "Little Librarian" whenever the occasion suits her. Dressed in her Friday night best, she introduced herself to different library vendors and promoted herself as "Little Librarian of San Carlos Library" so that she could collect goodies and play with their displays. 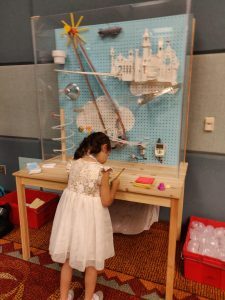 In the pic to the right you can see her submitting an idea into Contra Costa County's Idea Boxopens a new window during the Early Learning with Familiesopens a new window reception. Olivia stayed home the next day, Saturday, and I started my first conference day at 8:00 AM with a session entitled, "The Lunch Brunch: How to Start a Middle-Grade Book Club". It was presented by fellow co-worker, Jessica Ormonde of the Pacifica Sharp Park Library. The Lunch Brunch Panel. From left to right it's: Ame Maloney (SMCL Librarian), Julie Smith (Ingrid B Lacy School Librarian), Julie Finklang (SMCL, Pacifica Libraries Branch Manager), and Jessica Ormonde (SMCL Librarian). Jessica spoke about her partnership with Ingrid B Lacey Middle Schoolopens a new window to host book clubs once a month for 6th, 7th, and 8th graders. Funded by the Friends of the Pacifica Libraryopens a new window, these Lunch Brunch middle-graders get together to eat lunch at the library and talk about that month's book selection. 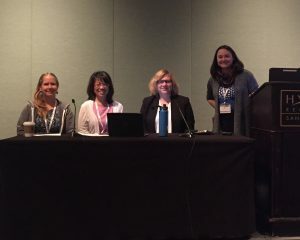 It was wonderful hearing about my co-worker's partnership with her local school and seeing her inspire other librarians in the room to do something similar in their own communities. Once Jessica's presentation was over, it was time for Saturday's keynote speaker: Kamau Ware, the creator of Black Gothamopens a new window. Kamau had the entire auditorium enthralled as he spoke about how one middle-grade girl changed the trajectory of his life and career when she asked him (during one of his educational workshops on immigrant struggles of German, Jewish and Italian immigrants of late 19th Century New York), "Where were the black people?" That single question launched Kamau to his public library to find an answer. Thus, Black Gotham was born and now people can take walking tours of New York that educate middle-graders, high schoolers and adults about the African diaspora of New Amsterdam (later to be known as New York). Kamau emphasized throughout the keynote that not only did that little girl change his life, but the libraries and librarians in his life did as well. Whenever people from his walking tours ask him where he found all his historical information, his automatic answer is, "In the library man!" 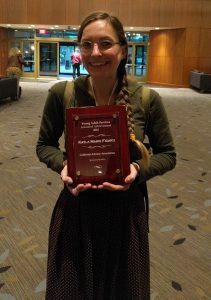 Kayla Figard and her CLA Award! Inspired and affirmed (by Kamau's speech) about my decision to become a Librarian, I went about my day ready to change the world! I went from session to session filling my brain with all sorts of programming ideas that could affect the lives of my local library patrons. I also got to present my own session on Saturday titled: "How to Make Emoji Pillows." This is a great craft to do with children of any age, and I wanted to share it with my fellow librarians. At one point in the afternoon, I was surrounded by 50 librarians all asking me what the best embroidery stitch was to attach emoji facial expressions. Another great moment was when our very own Kayla Marie Figard of the Belmont Library received the 2018 CLA Young Adult Services Awardopens a new window for being such an inspirational presence to teen library patrons in her community. CLA presents this award once a year to Teen Librarians who have distinguished themselves among their peers for exceptional library services. The panelists for "So You Want to Start a YA Novel Convention?" Sunday was a much more relaxed day. Again I found myself at CLA at 8:00 AM listening to my fellow coworkers Kayla Marie Figard, Darren Heiber and Kathryn Wiszowaty talking about YANovCON, SMCL's very own Young Adult Novelist Convention. Be sure to RSVP for the eventopens a new window which will be held this year at the Millbrae Library on January 26th, 2019. 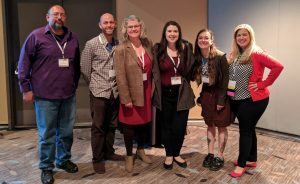 Though I am a Youth Services Librarian at the San Carlos Library and tend to work with babies to 4th grade, it was eye-opening for me to learn about the wonderful things the teen librarians are doing in my own system. My favorite story during this session was shared by Kayla when she talked about how she measures the success of YANovCon. She said, in summary, that YANovCon's success is not carried in the number of attendees but in the micro, personal and meaningful interactions the authors have with their teen audience during the convention as well as during school visits (which precede the convention). Kayla explained that to allow teens such a personal and up-close interaction with a novelist is life-altering. In the personal and small-scale moments these conventions create, teens can connect with an adult they admire and create a bridge or lifeline that will get them out of their own personal struggles as they journey into adulthood. The creation of these bridges, even if it is just for one teen in the midst of deep interpersonal struggle, is the true measurement of success for events such as YANovCon. Circling it all back down to Kamau...libraries change lives and I am proud to call myself a Librarian and work with so many other great librarians. To all my other fellow SMCL co-workers I saw present at CLA but could not mention (otherwise I'd be writing a novel and not a blog post! ), you rock! Keep up the good work and see you next year at Pasadena CLA!